The annual meeting for Russian Heritage is scheduled for Saturday, April 29 in the Triton Room at Eckerd College. The program will begin with a reception and cash bar at 5:30 pm, followed by the business meeting and election of officers at 6:00 pm. A buffet dinner and the program “100 years After the Russian Revolutions of 1917” presented by Bill Parsons, Professor Emeritus of History from Eckerd College, will follow the business meeting. The cost for the buffet dinner is $20. Directions to the Triton Room can be picked up at the entrance gate to Eckerd College (4200 54 Ave. S. St. Petersburg, FL 33711). 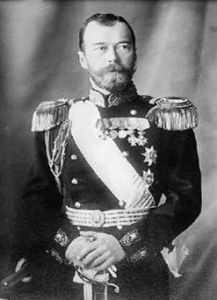 In 1917 “the world was turned upside down” by the events in Russia with the downfall of Nicholas II and the Romanov monarchy and the rise of Lenin and the Bolsheviks. What is the legacy of these dramatic events? Professor Parsons spent much of his academic career dealing with this question. 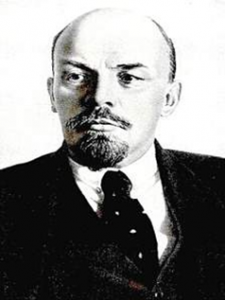 His PhD dissertation focused on the historiography of the Russian Revolution and he taught courses in Russian and Soviet history at Eckerd College for 40 years. He will share his reflections on the influence of the 1917 revolutions on Russian and World History. Continuing for one more year on the Board of Directors are Victoria Peppard and Natalia Scarberry. Cadidates for the additional four positions on the Board are: Vera Cimino, Vladimir Khokhlov, Marina Mendez, Elly Roche, Zhanna Sidorenko, and Zhanna Thomas. VIP Reception. 5:45 – 6:45 pm. 3-course sit-down dinner at 8 pm. 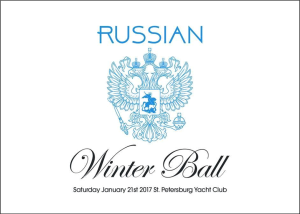 The Russian Heritage Winter Ball is coming on January 21, 2017. 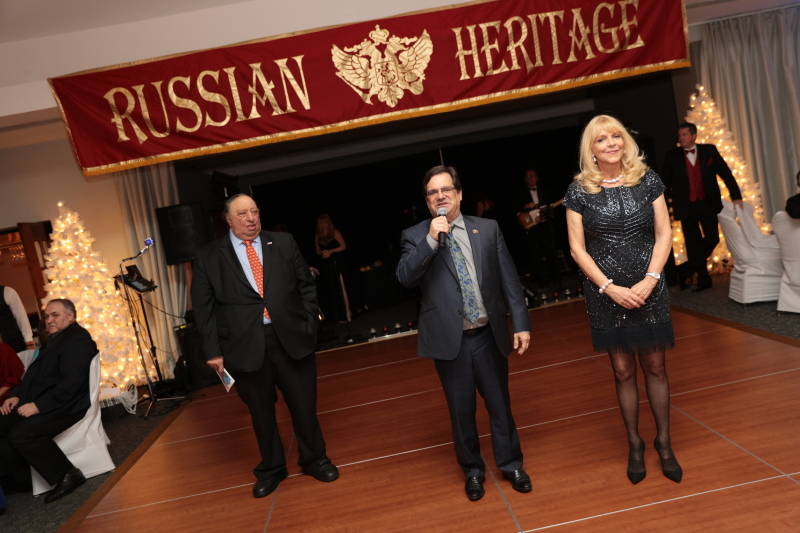 Program highlights dancing to the music of the Dazzlers, performances by singer Elona Krasavtseva, ballet and ballroom dance performances, and an excellent raffle/auction. IF YOU CHOOSE TO PAY FOR YOUR TICKETS ON PAYPAL, GO TO THE PAYMENT PAGE OF THIS WEBSITE. AFTER COMPLETING YOUR PAYMENT, PLEASE GO TO THE CONTACT PAGE TO LET US KNOW YOUR MENU PREFERENCE (BEEF ALA BYLINA OR FISH ALA SKAZKA) AND INDICATE THE PEOPLE IN YOUR PARTY YOU WOULD LIKE TO BE SEATED WITH. 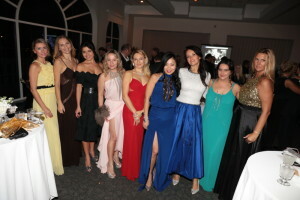 Images from last year’s Gala Ball. 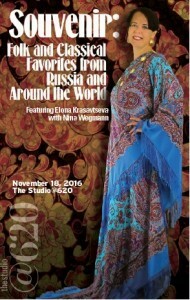 The Studio@620 and Russian Heritage present an evening of traditional Russian folk songs, some of which are over 500 years old, sung by Elona Krasavtseva (lyrical soprano) accompanied by Nina Slyusar-Wegmann (accordion and piano). 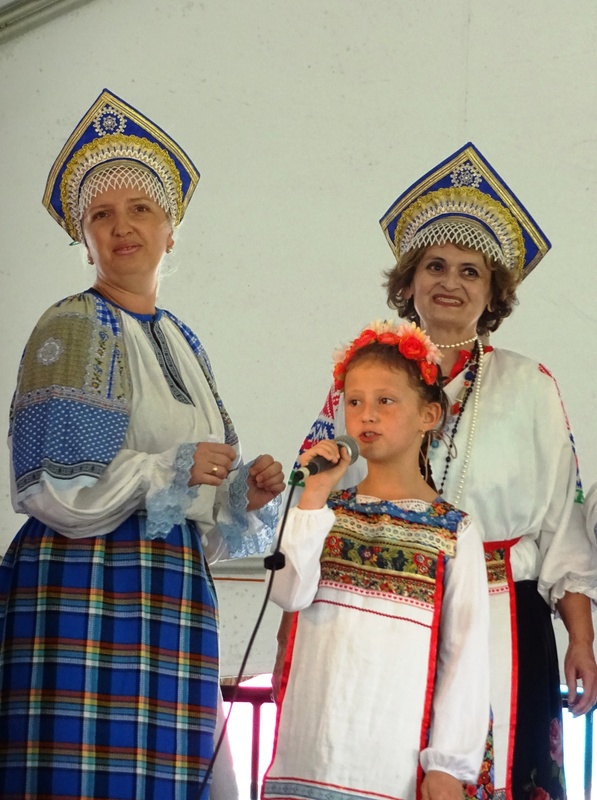 The program will include a range of song styles, including wedding songs, also called “crying songs”, because weddings in northern Russia were for many years considered a sad event, as it meant that young girls were sent far away from their homes and families. 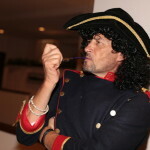 There will also be a lot of sunny, hilarious, cheerful Italian and Spanish music, spiced with American and English favorites too. You’ll be on a musical world tour so come enjoy these tonal souvenirs! Elona Krasavtseva is an award winning singer and songwriter from Moscow, Russia. In 2013 she was named a National Treasure of Russia for her songwriting and performance. Elona performs in New York City and Los Angeles, as well as in Europe including Russia, Belarus and Kazakhstan. She runs a Music and Poetry Club in Florida. The first book for our book group discussion is Pushkin’s novel in verse Yevgeny Onegin. We will meet at 3:30 pm in the Clubhouse of the Envoy Point Condominium (7150 Sunset Way, St. Pete Beach). Please call 813-300-4785 to let us know that you are coming and to alert the Security Gate attendant. New Board Member Evguenia Davenport who teaches at USF in Tampa has agreed to help facilitate this discussion. The plan is to discuss the work in English and you are encouraged to choose any translation you find, or read it in Russian. 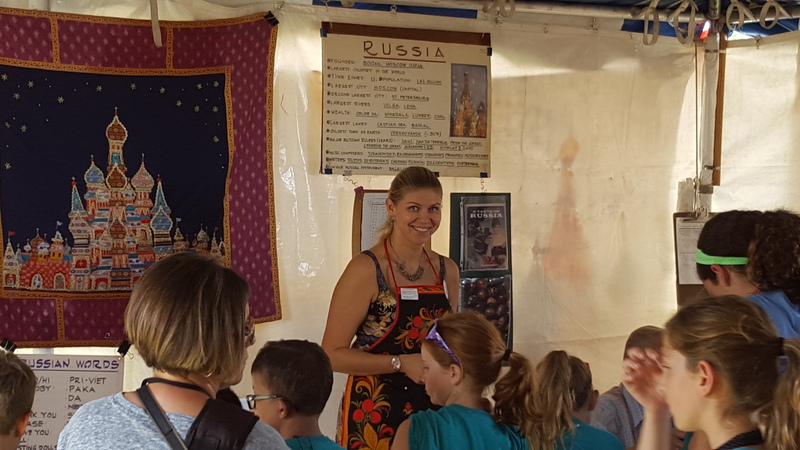 Russian Heritage will participate in the annual SPIFFS Folk Fair at Vinoy Park in downtown St. Petersburg with a “Russian village” presenting Russian culture, foods, and entertainment. On Thursday and Friday students from local schools will attend the event and on Saturday and Sunday the park will be open to the general public. The cultural displays will include information about famous Russians and Russian cultural traditions, including art work and souvenirs for sale by Vladimir’s Collection. 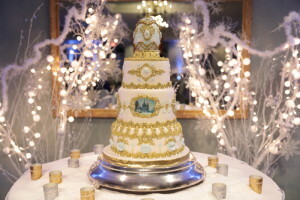 A Russian dessert will be available for purchase. 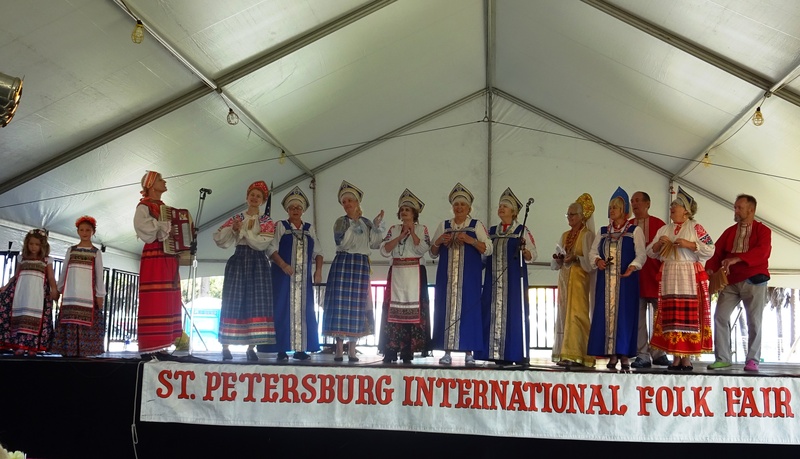 Russian Entertainment will be provided by Andrei Cheine and the Russian Chorus at 11:00 a.m. on Saturday and by Suzanne Pomerantzev’s St. Petersburg Folk Ensemble on Sunday, at 2:40 p.m. The Parade of Nations will take place on Saturday, October 29 at 2:00 p.m. We invite you to support our Russian entertainers and if possible march with the Russians in the parade on Saturday. 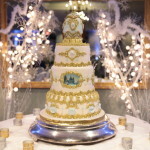 For more information go to the SPIFFS website at www.spiffs.org or call Mary or Gene Stenov at 727-867-6013. Saturday, November 5. Book Discussion of Yevgeny Onegin by Alexander Pushkin at Envoy Point Clubhouse (7150 Sunset Way in St. Pete Beach at 3:30 p.m.
Saturday, January 21, 2017. 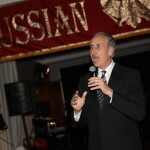 RUSSIAN WINTER BALL at the St. Petersburg Yacht Club. 25 YEARS AGO LENINGRAD BECAME ST. PETERSBURG AGAIN! Come celebrate the opening of the new “Peter Demens and the Two St. Petersburgs Archive” AND the 25th Anniversary of Leningrad returning to its historic name of St. Petersburg in September 1991.When: Saturday, September 17 at 2:00 pmWhere: The Poynter Library of the University of South Florida St. Petersburg. 140 7th Avenue South, St. Petersburg, FL 33701. 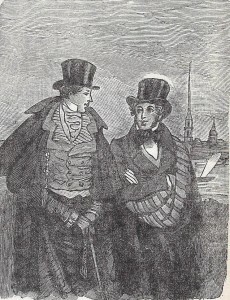 See exhibits from the “Peter Demens and the Two St. Petersburgs Archive” and meet people who have played an important role in the relationships between the two cities, and be a part of the discussion for the future relations between the the St. Petersburgs. Where were you in 1991 when the Russian city became St. Petersburg once again, and what was your attitude towards the changes in Russia at that time? Be a part of the discussion. Annual meeting and Elections: Sunday, April 24, 2016. 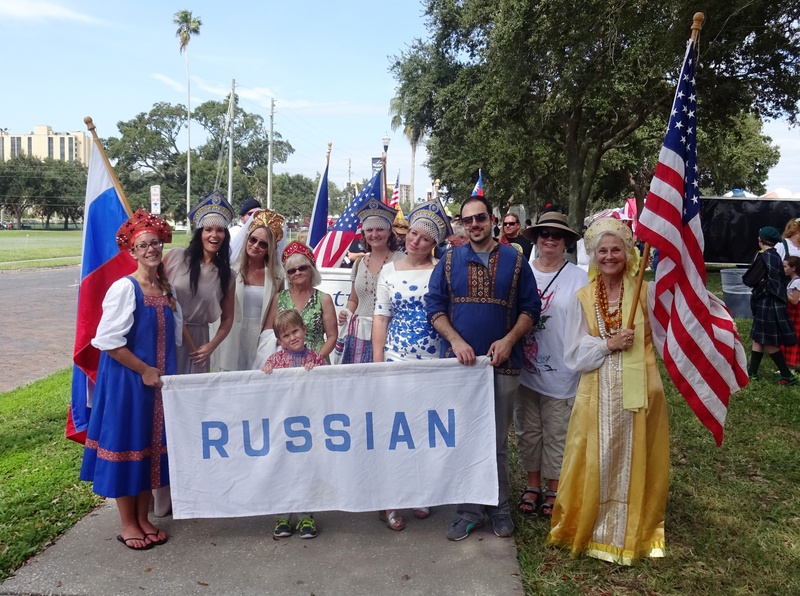 The annual meeting for Russian Heritage is scheduled for Sunday, April 24 at 4:00 pm in the Triton Room at Eckerd College. The program will include a short business meeting with elections for the Board of Directors (the four officers are completing the first year of their 2-year terms). 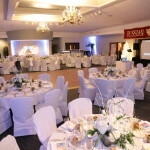 The program for the meeting will include a power-point presentation of some visual highlights of our first 20 years, including video clips of our first Old Russian New Year Gala. 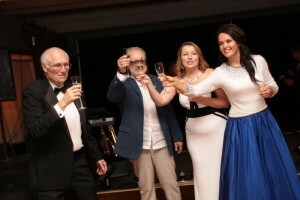 A musical program will also be presented by one of our newer members of RH, Elona Krasavsteva. The cost for the delicious chicken buffet dinner is $20 for adults and $12 for students. Directions to the Triton Room can be picked up at the entrance gate to Eckerd College (4200 54th Ave. South in St. Petersburg). The nominating committee has received the names of candidates who have expressed interest in running for a position on the board. If you would like to nominate someone for the board, or if you are interested in becoming a candidate, please send this information to the nominating committee at russianheritageflorida@gmail.com. 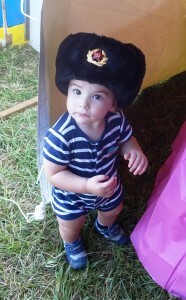 Please indicate how you think this person will contribute to Russian Heritage in the future. And remember, in order to vote at the annual meeting or serve on the Board, it is necessary to be a member of Russian Heritage for 2016. 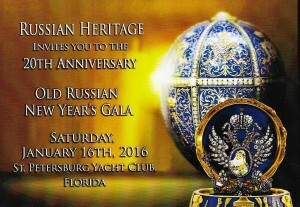 Please RSVP to: russianheritageflorida@gmail if you are planning to come to the annual meeting. 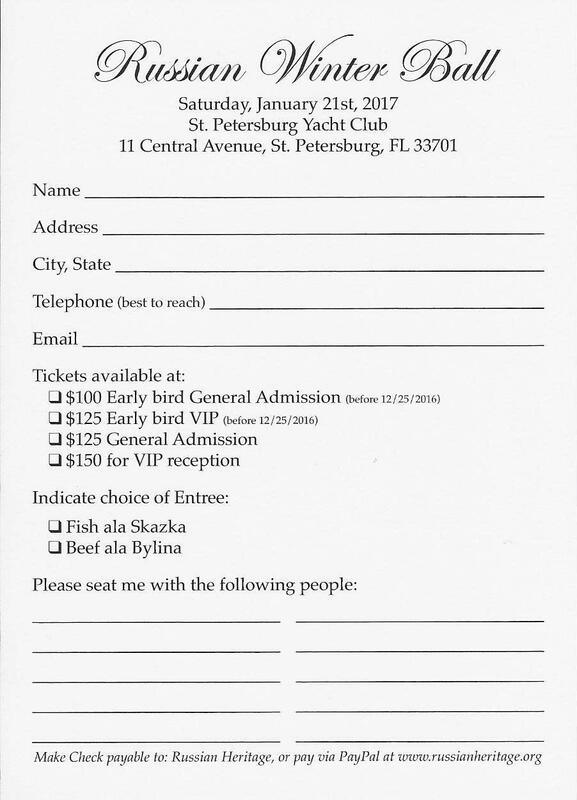 Payments may be sent to: RH, PO Box 14552, St. Petersburg, FL 33733, or you may pay at the door, but please do RSVP now. ALEXANDER TSYGANKOV and INNA SHEVCHENKO have performed together for many years. Their touring schedule has taken them to most of Europe, the United States and parts of Asia. Mr. Tsygankov has been called the “Russian Paganini” and holds the coveted title of Distinguished Artist of Russia. He has performed at the White House, Carnegie Hall, New York’s Lincoln Center and has thrilled audiences in Washington D.C.’s famed Kennedy Center for the Performing Arts. 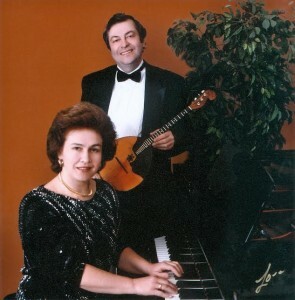 Russian Heritage presents Alexander Tsygankov and Inna Shevchenko at Studio@620 on Wednesday evening at 7:00 pm. This is an evening of Russian Heritage that will include incredible Russian music, and a taste of poetry and Russian food. Alexander Tsygankov will perform a variety of pieces of classical music and Russian folk music. Florida poet laureate Peter Meinke will also participate in this program. Tickets for this program are $20 for adults and $10 for students. 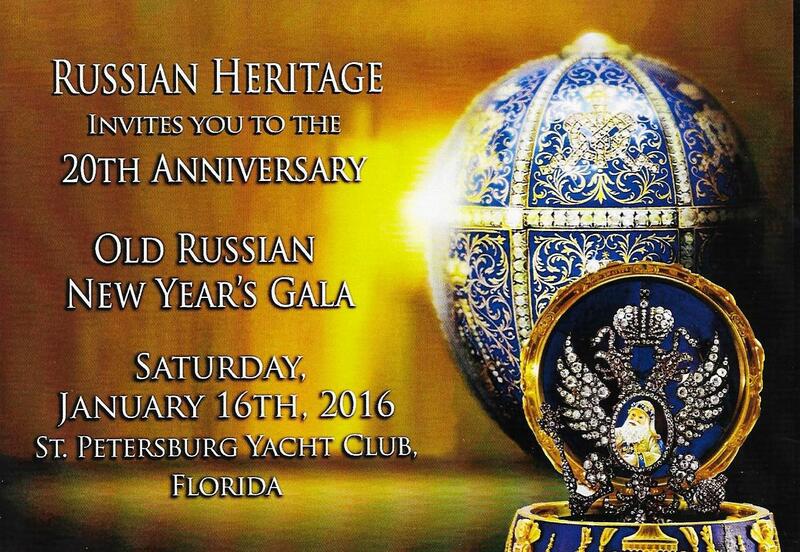 Members of Russian Heritage will have a discounted rate of $15. 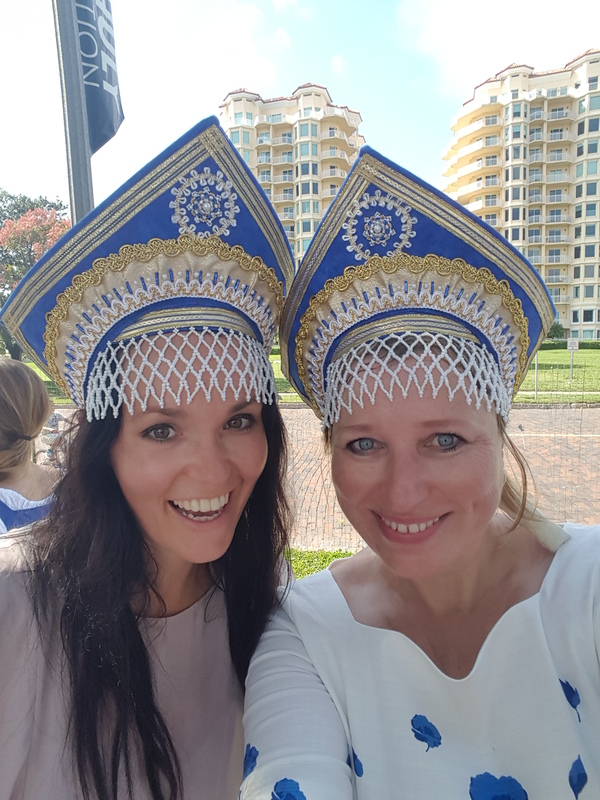 As a special incentive for persons to learn more about Russian Culture and the programs of Russian Heritage, anyone attending the concert will be given a free membership to Russian Heritage for 2016. For those who attended the Old Russian New Year Gala, this will also be an opportunity to view the photographs from the party and to obtain pictures as souvenirs of the event. 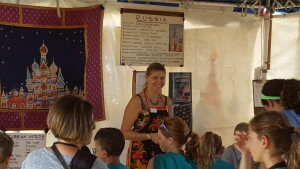 Russian Heritage participated in the 41st annual SPIFFS Folk Fair October 29 – November 1 in Vinoy Park, greeting thousands of students and adults and sharing Russian culture with those who came. 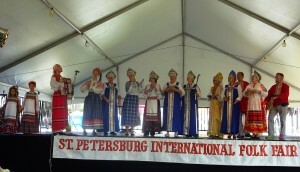 Russian entertainment was provided by the Russian chorus led by Galina Popova and the Russian dancers (St. Petersburg Folk Ensemble) led by Suzanne Pomerantzeff.